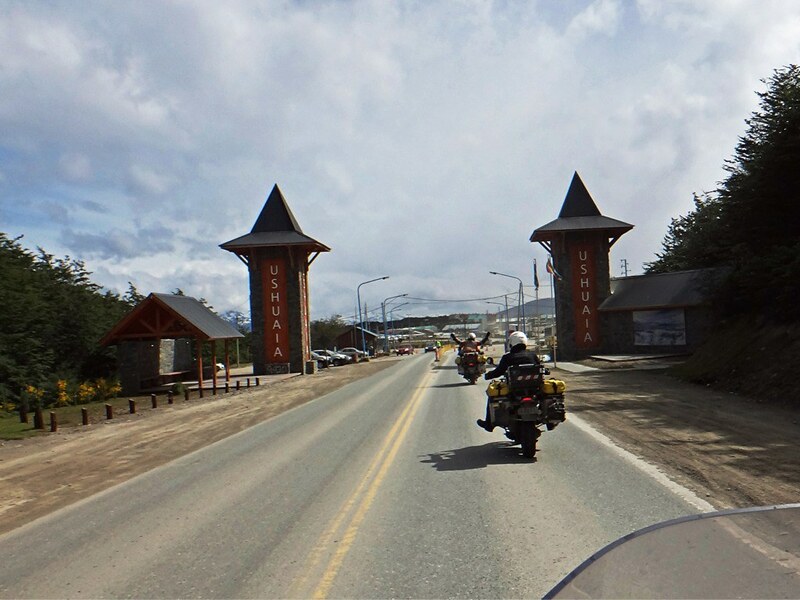 A trip from the top of Alaska to the bottom of Argentina. Why? Because we can. What can we say. 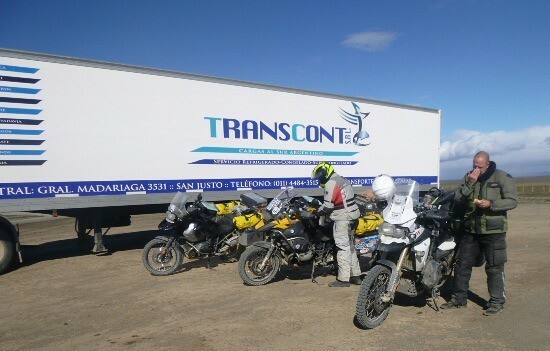 We have now ridden from the very top of North America to the very bottom of South America. What a blast! An incredible and amazing adventure. And it's not over yet! The weather forecast for today was for increasing westerly winds and rain so we didn't hang around too long this morning, knowing that our first 120kms would be gravel. During the afternoon two other groups came in. 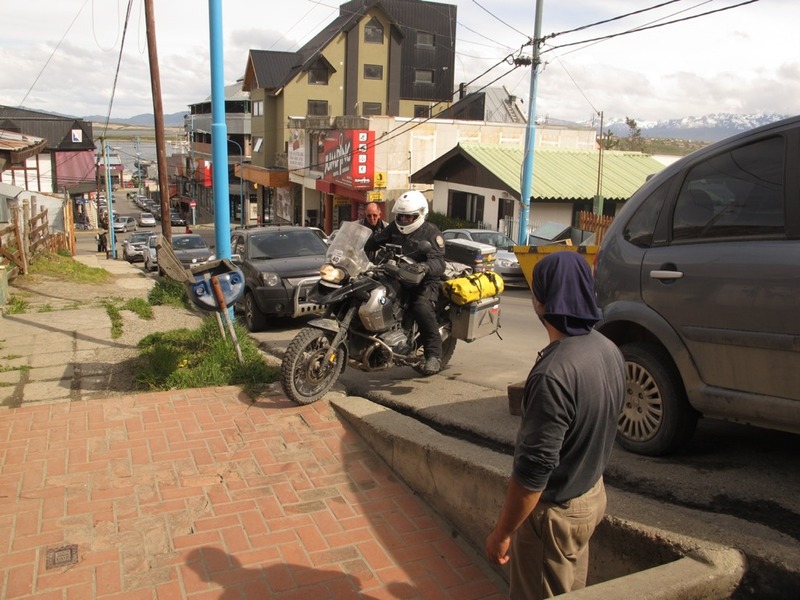 This one from Brazil heading for Ushuaia, one on a 1200 Suzuki Bandit! 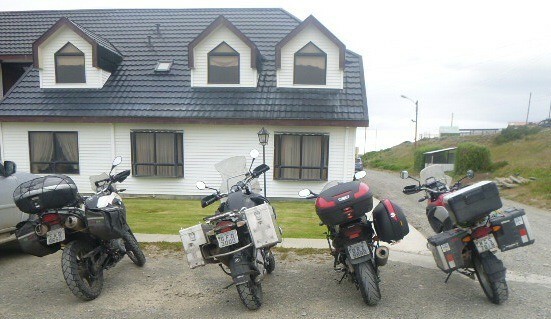 And this group of Australians on a guided tour from Ushuaia to Santiago on BMW 800s and 650s. With a pickup and trailer to carry their gear. And a spare bike to allow for a breakdown. The wind was picking up as we rode out at about 7.45am and once again it meant that photo opportunities were limited. We rode towards Onaisin and hit the gravel after about 20kms. Despite all the dire warnings we have had, it wasn't too bad. Certainly not after Ruta 40! We basically got on with it and the wind, while a nuisance, was ok. So were the trucks who treated us very well, one even stopping and pulling over to let us by. And another conveniently parked as a wind break so we could have a stretch. The landscape was pretty barren. 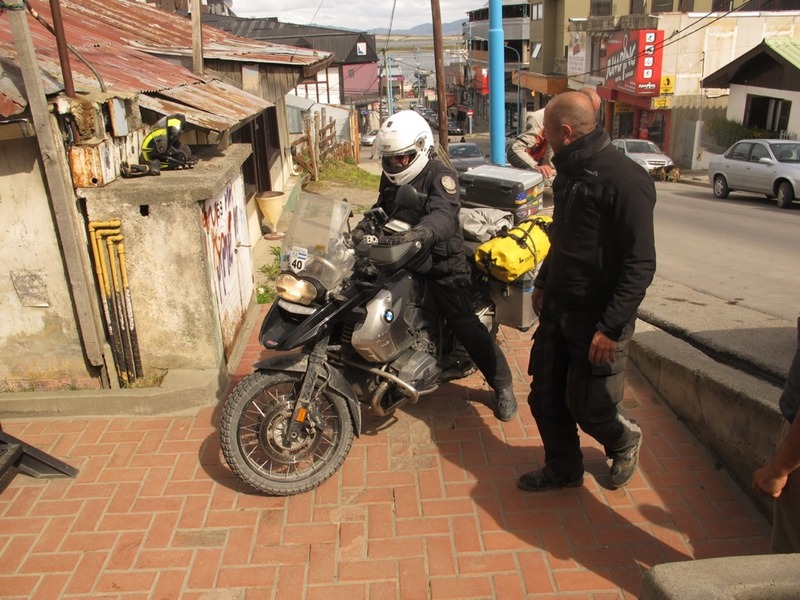 After about two hours we arrived at the Chilean border post. It was pretty quick - I had mislaid one of my forms and the official told me not to worry and simply filled it out again on the spot. It was then a huge ride - 12kms? 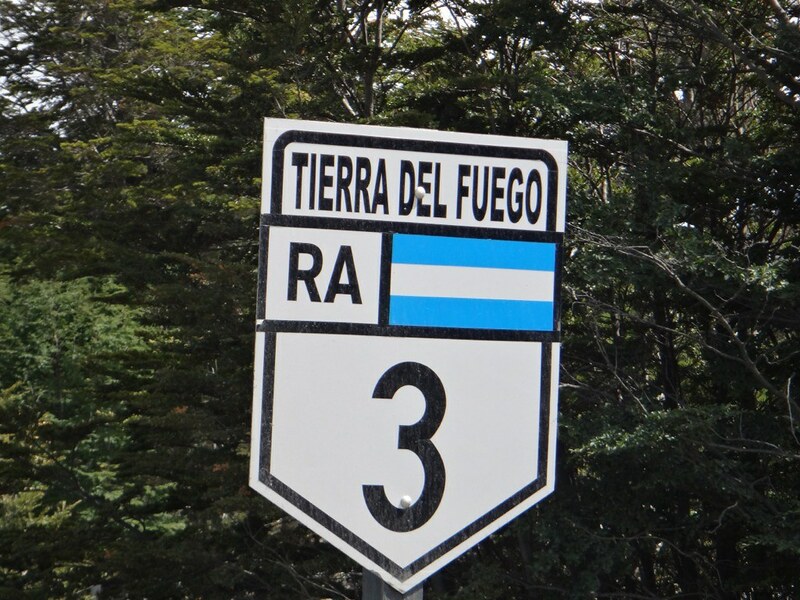 - to the Argentinian border where we went through the rigmarole once again of getting ourselves and then our bikes into the county. A little sour note here as Mrk had one of his gloves stolen off his bike. He had left his sunglasses inside the glove and on the handlebars and someone lifted it. We couldn't work it out at first. Who would want to steal one glove? And looked all around for where the wind might have blown it. Then he remembered about the sunglasses. So if you happen to see an Argentinian truck driver with only one hand and wearing flash sunnies, please give Mark a call. We had a quick bite to eat here before rolling on south. The wind was picking up now and it was hard work. 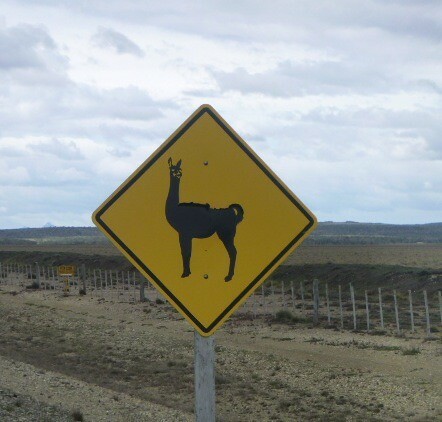 I loved this sign though. Gradually the landscape became less barren and the trees went from being wind blown shrubs to being respectable trees. We went up and through a mountain pass with the temperature sneaking down to around 5 degrees and a little flurry of snow. 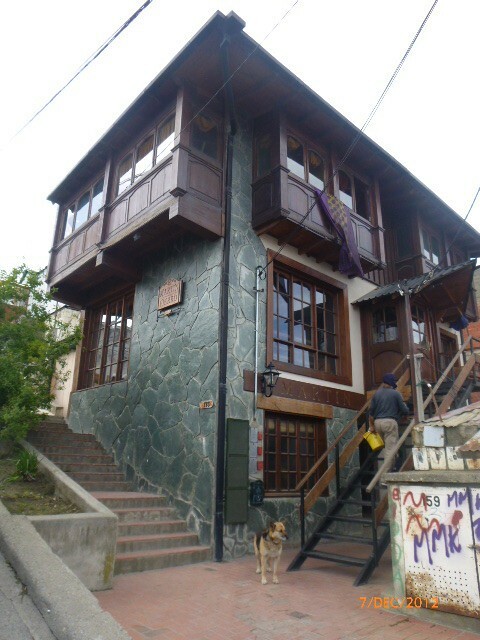 Then at last we were in Ushuaia. You need to enlarge this photo. 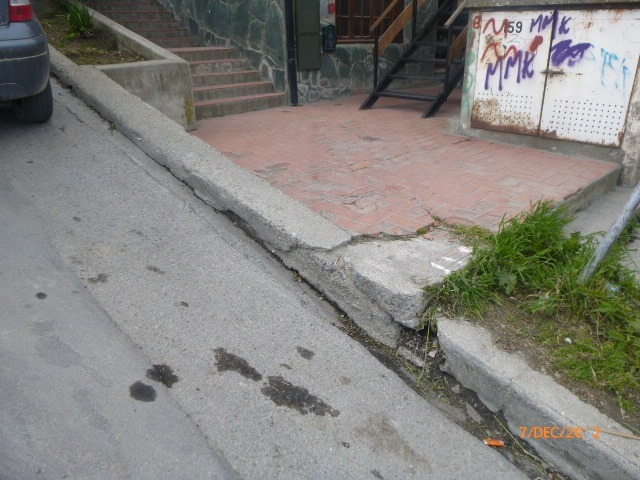 The street was very steep (think Baldwin Street in Dunedin) and we had to ride up, turn hard right to line up with the notch in the step and go for it. Phew. 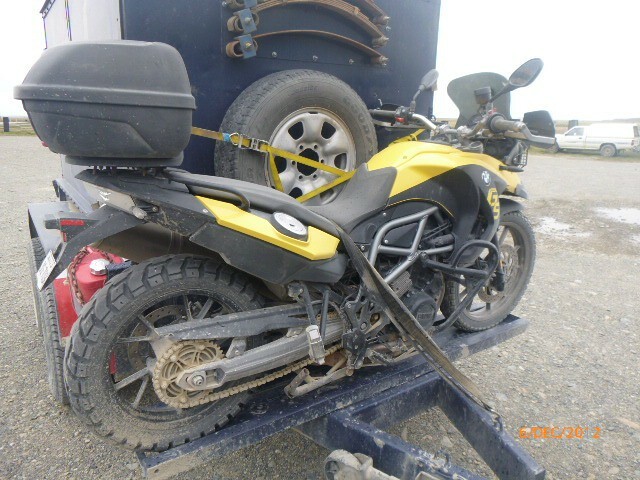 All this from Prudhoe Bay to Ushuaia and then to fall over in the last two metres? The girls look quite comfortable now though. 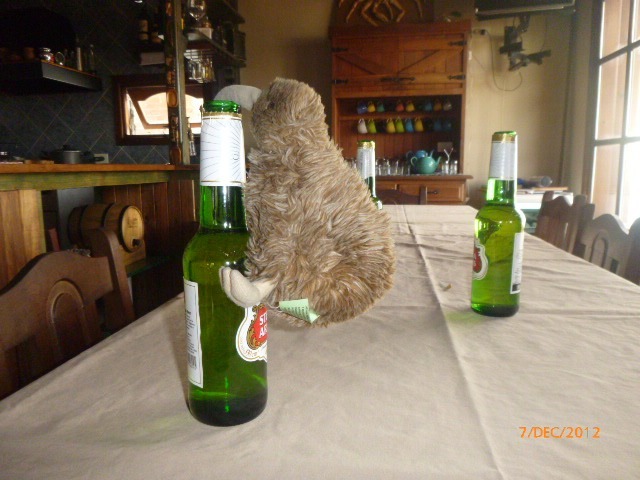 We all had a beer to celebrate. 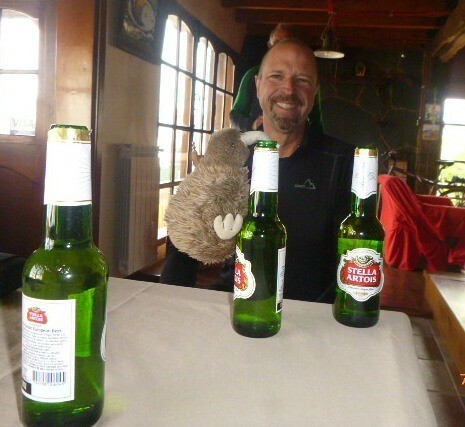 Kiwi behaved quite disgracefully. And so we are here. We will have a day or two here, do the tourist thing and then turn back along the same road as far as Punta Delgada. We will then turn right to the east and head for Buenos Aires. It all feels a bit funny, not exactly an anticlimax but a sense of unreality in a way. It has been a huge trip. I'll get out and about tomorrow - this looks like an interesting town. 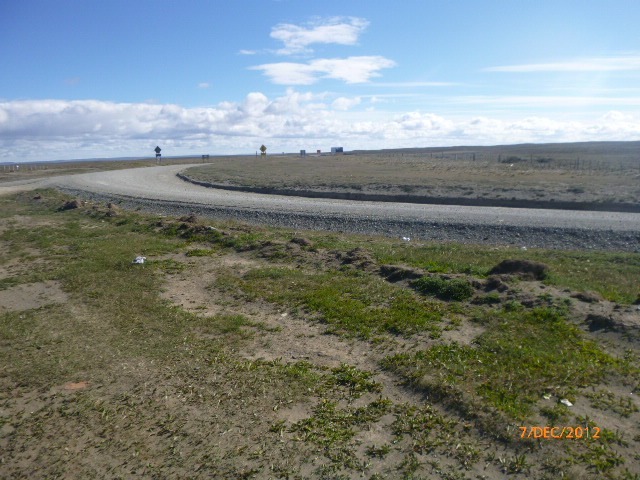 Every year I have tried to do a reasonable motorcycle trip. Up until 2009 it has always been around New Zealand, mostly on either my Honda ST1300 or the Suzuki DR650. 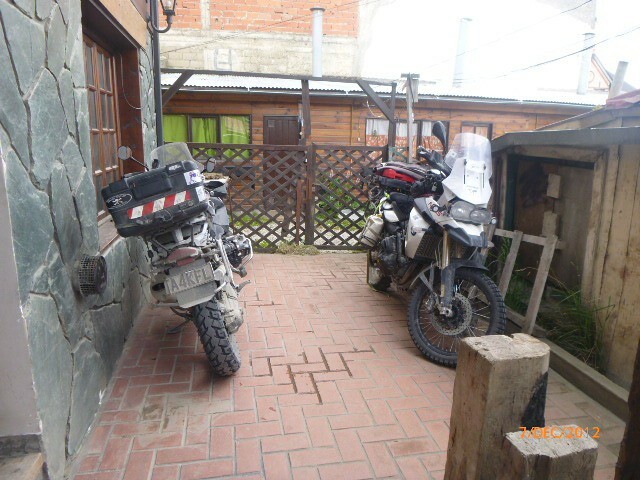 In 2010 I bought a BMW R1200GS for a circumnavigation of Australia, choosing that bike mainly for its offroad capabilities. In 2011 we travelled around the Himalayas on a brand new 1957 Royal Enfield Bullet 500. Great fun. 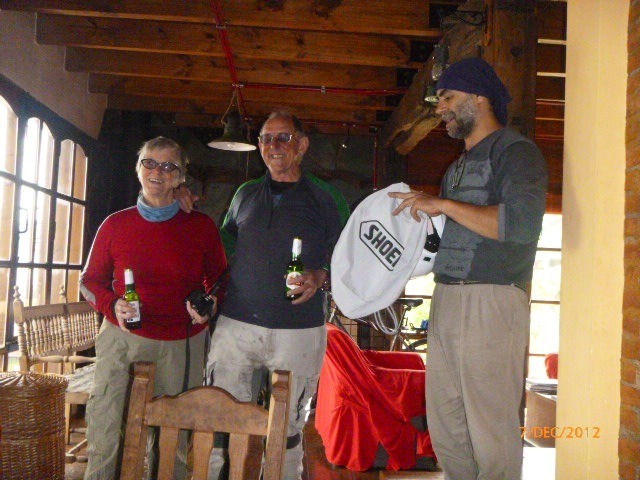 In 2012 Shirley & I rode from the very top of North America to the very bottom of South America (See ebonyandken.blogspot.com) Now for something different - a little pootle from Cape Town, through Namibia and Botswana and into Zimbabwe.